I refer to the article “Singapore Blogger Faces ‘Financial Ruin’” (Forbes, Jun 24). I understand that Roy Ngerng’s court hearing for the assessment of damages on the defamation suit against him (already decided by summary judgement) shall be from 1 to 3 July. As I have written a few hundred articles, letters published in the newspapers’ forum pages, gave presentations and talks (some of which are on YouTube), etc, in the last decade or so – I thought that it may be interesting and in the public interest, to try to summarise some of the questions on CPF that Roy Ngerng and others have been asking. What is the historical weighted average interest rate per annum of all the different CPF accounts, namely the Ordinary, Special, Medisave and Retirement accounts? What is the GIC’s annualised return from its inception in S$ terms? Is there any other country in the world that keeps so much of the returns from the national pension fund – from the people? Is it true that since 1999, the CPF had the lowest real rate of return amongst all national pension schemes in the world? If we assume the weighted average CPF interest rate to be 3.5%, and the GIC’s annualised returns from its inception to be 6.5% – it has been calculated that a Singaporean earning $1,000 at age 21 at the current 37% CPF contribution rate, and his salary increasing at 4% per annum – may have lost more than $1 million by age 65, because of the difference in the interest rate. How do Singaporeans feel about this? Then Manpower Minister Ng Eng Hen said, “The answer is no”? 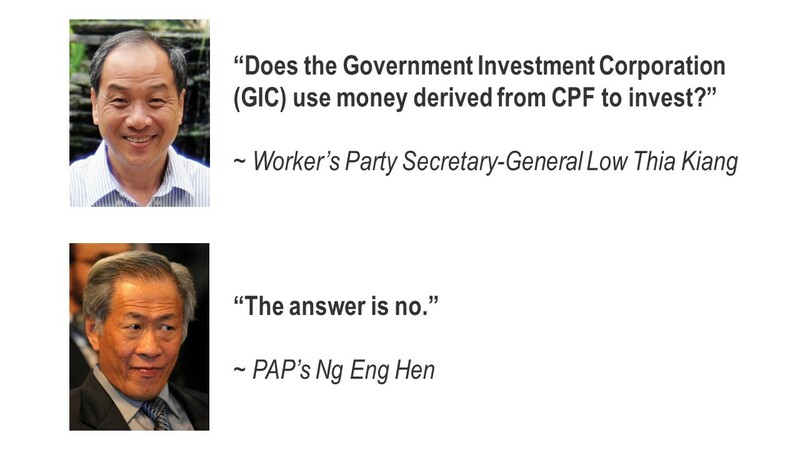 And also why did former prime minister Lee Kuan Yew say in 2001, when he was the chairman of GIC, that “I want to clarify that there is no direct link between the GIC and the CPF.”. 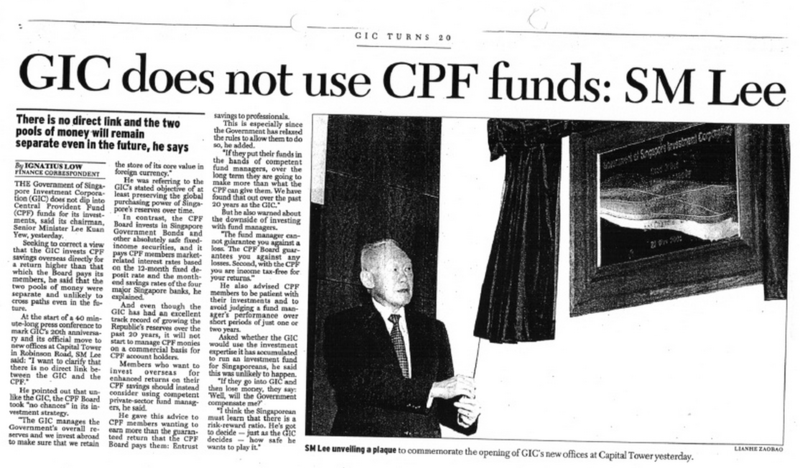 The Straits Times carried an article headlined, “GIC does not use CPF funds: SM Lee”? Then Minister for Labour and Communications Ong Teng Cheong said in 1982 that, “CPF savings form a large portion of Singapore’s savings. These savings are used for capital formation which means the construction of new factories, installation of new plant and equipment, expansion of infrastructure such as roads,’ ports and telecommunications, the building of houses and so on”. Temasek has an annualised return of 16% per annum. Since state companies like SingTel were built with CPF funds and were transferred to Temasek – how can the Finance Minister say that “No. It (Temasek) has never managed CPF funds”? 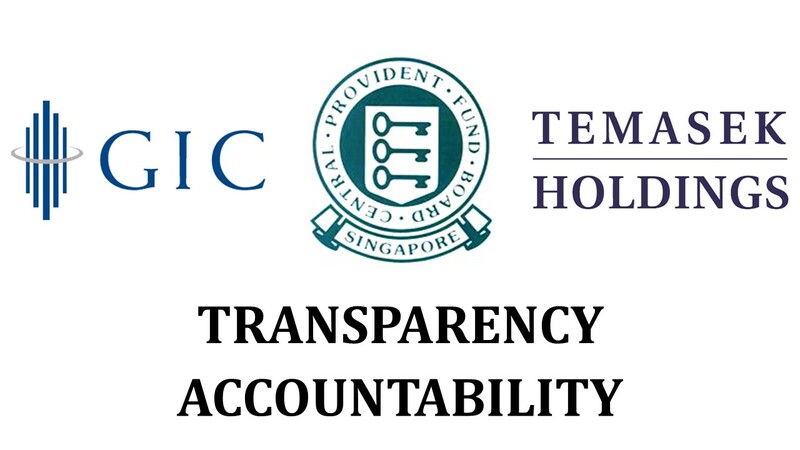 According to the article “Singapore’s GIC Suffers $41.6 Billion Loss” (The Wall Street Journal, 30 Sep, 2009) – “Government of Singapore Investment Corp. suffered a loss of about 59 billion Singapore dollars (US$41.60 billion) in the fiscal year ended March 31, making it one of the worst years for the sovereign wealth fund since it was started in 1981, people familiar with the situation said Tuesday. So, if we add Temasek’s “negative Annual Wealth Added of $68.1 billion in 2009″ to GIC’s estimated loss of $59 billion in 2008/2009 – does it mean that we may have lost about $127 billion? To put this amount in perspective, does it mean that we may have lost more than double our total Government spending in a year (2008) or about 84 per cent of our total CPF funds then of $151.3 billion in 2008 (CPF Trends, October 2013) in just one year? Singapore’s finance minister: “People do want to know, there is curiosity, it is a matter of public interest. That is not sufficient reason that there is curiosity and interest that you want to disclose information” ( August 18, 2009). Your life fortune solely rely on the lawsuit case for Lee family . you got more wealth if they sued more Singaporeans . Youasked in last page , what’s wrong of PM ? 1) PM hired you here used “Tinkerbell” & “The Oracle ” , ” Slayer”, ” lolz” …… as PM’s adviser. in charge the persecution campaign .he used you such crafty knave . that was first wrong, and caused his political life to the end . that time, you knew the 91 years old founder father at home and sick , you don’t care founder father ? he had gaven you so much forever endless fortune, but you return just no stop persecuting , such as this year to the 16 years old boy and, last 360 days persecuting Roy & other 5 Singaporeans , that was second wrong, PM used the bad adviser. you lead the people seen his impotent and selfish, he broken the harmony since he not accept the firts 5000 cash offer . 3) you “The Oracle ” and “Prince” = ” jackfruit “ = ” Viper ” , and ” Question ” = ” Jim “, ” Royisloser “, ” Jg ” , and ” james ” formed the gangs 4 , you in charge the ” law contact “, logo ” Jim ” in charge betray, leaking and grammar correction, that rest are secondary . 4) you are the real gangs work for PM, responsible for tattler, and manufacturing fake news, took advantage of high position, leaking the nationals private account , In order to further threats and intimidation against nationals . that was third wrong of PM, his authority become clown office , blockade the truth , even PAP ministers have been deceived by you. even they owe you zero, motionless except you ike to ask ” do you know English ? ” , you are very good to use a rotten trick . Although I did not go to english school ……, it is not big deal , but I can recognize you and the gangs who work inside the PM office , you need PM issue money to you and your family more than anyone of us . so your job is bring the pains to the people which is irreparable. that was the 4th wrong of PM, he did not aware that you gangs 4 led Lee Kuan Yew hasty departure. PM LHL ever said : ” we are paying correct salaries to morally upright and trustworthy civil servant ” ——– even in your office ill deeds cannot honour , Singaporeans see a great talker is a great liar. that was the 5th wrong of PM, LKY’s elite is not to be found in the market. clearly, you misled PM too much , but why you are here dying struggle ? you gangs 4 first lit the fire, PM become your firetruck may not successful . at moment 40% want LHL step down . 8) it doesn’t matter that ability of opposition party, that matter is the 51% of voter want them take over the leadership , This is your credit. you remind people to rethink about PAP, indeed you gangs 4 destroy PM and PAP . that was 6th wrong of PM, he depend on you gangs 4 too much, and you double tongue , seems got his permission to show the public that gangs control the law and above the law. any human will mistake or do something wrong, about forgiveness ? my personal view is, if he sued for 250,000 .00 SGD, no forgive ! instead of asked huge money again through the lawsuit. in any time I have position to judge about you gangs , i am not only the witness, I am also the employer for 10 years i have done my contribution to Singapore by sending cheque paid each of my employees CPF . this is a deal . once again, we talk to LHL’s Authority ,but how come his Authority transfer our feedback into the second hand market ? who knows you gangs take over ? your persecuting deal reall no market . Until the authorities eradicate them ! Why so kiasu? Jialat ! here is Roy’s blog, if you want singlish copy, you have to pay first , because you are so special , so here no free for you…..
you earned so much from PM, your each of income was made from broken other’s life . very sad, why PM did not aware this ? also your figures wrt polling for next elections seem very dodgy and unreliable… who did this survey to get these figures? prove plz. in any case Singapore utilises a first-past-the-post system, which means that PAP doesn’t need to get at least 50% of votes to gain its majority. And 40% wanting LHL to step down doesn’t mean that 51% want to vote opposition. wrt gangs… well… believe what you want. If it suits your delusions of grandeur to think that someone who works in the Istana would lower themselves to talking to the likes of you, then more power to you I suppose. Congrats on your self-esteem. i have already rewrite Chinese copy for you . Roy, what is the paper loss with regards to investment? Investor always invest over long term right. Yr guru know his stuff? Unlike Roy, Leong is smarter and has not draw any conclusion. Leong claims to have written hundreds of such articles but apparently without conclusions and let people like Roy taking Leong’s cue and draw conclusions but fall into a pit. I went into Forbes but couldn’t find leongs piece but one by a ex Singapore police officer who has migrated with his whole family. His contention is that now that he has migrated and looking from afar, he could see all the flaws and worms in Singapore. He said he was full of admiration for Singapore when he was serving in the Singapore police force. Now from far away he could only see flaws. I thought one would only feel the heat when inside a kettle. My contention is that he and his family migrated because their children though smart could not qualify for places in singapore u. But don’t forget they can still get one if they want to, by way of innuendo… the late late Lee kuan yew was good at that. June 26, 2015 - 11:47 pm Return Our CPF $$$ & Go Harakiri! Day Light Robbery:( National Tragedy, Betrayal, Mismanagement & Treason? Let’s Think About It. 以為我們和他一樣臭味相投 ？ 好吧, 下面為滿足你開專輯 . 首先， 他們下令國家醫院24小時內立刻終止 對Roy 鄞义林 的僱用， 然後通過報館把 鄞义林修理一番， 警告全國記者沒有人敢採訪 鄞义林，迷失方向的總理為了獎勵他們， 高興得帶他們一起去土耳其玩了一週。讓他們享受在一人之下，萬人之上的特權. 显然，你误导總理太多了，你把重要的民意說成無能的民粹， 你向總理做太多反方向的誤導，好比把陰天報告為豔陽天，說謊不扣工錢嗎 ？ 但你为什么在这里？是你們首先點火，把總理當成你的消防隊，你這麼賭博，如果不会成功，李總理靠你了 ? 在任何时候，我有立場發表我的見證，因為我也是連續10年為新加坡員工繳納公積金的雇主，也就是說，當總理秘書以當局口吻警告我們滾出去的時候，除了對李總理非常驚訝之外，就剩下非常氣憤， 因為你們的高樓大廈裡面有我們的一磚一瓦， 在你們衣冠楚楚裡面， 由我們的一針一線，在你們所謂精英高薪裡面，有我們的一分一毫。我們對新加坡做出了貢獻。總理派這個助手F 2 接手, 天理不容. Leong is basically saying that everything Roy writes is rubbish. I think Roy himself made it up. Roy, wake up. Are you sure there is such a letter from Leong or you made it up? If you made it up, it’s a criminal offence. Can I ask leong about it? Trem is full of bugs. Y so dirty one like PAP? The PAP is no longer running the country. – According to Roy. Leong is a smart coward. As always Roy is the sacrificial pig…Gu Lu York, anyone,? at moment, you need a mental doctor more than this boy. we and our children did not want SG job, but you want , until you 65 years old . you jealous comes from your womb problem. how come PM LHL hired you as his private secretary ? he was sick ! he would even not shelter his son, how could he shelter you ? still want on behalf of PM to threat ? PM still hand over his email to you ? pamper your ? spoil you ? allow you to steal other’s information to sale ? become second hand ? we have sent to SG President already , hope they will settle . 和我們比 ？比什麼 ？ 怎麼比 ? I don’t trust this PM. He is just picking up the remnants left over by his father. 1) What is the total cost to mint 20,000 new citizens in terms of reserve dilution,education subsidy,housing subsidy? 2) What is the interest lost per year as per cpf interest lost rates? Your CPF is Not Your Money. This is How.